Broaden the reach of your wireless network. Want to cover your entire home or office in wireless capabilities? Have an obstructive layout and are worried about dead zones? 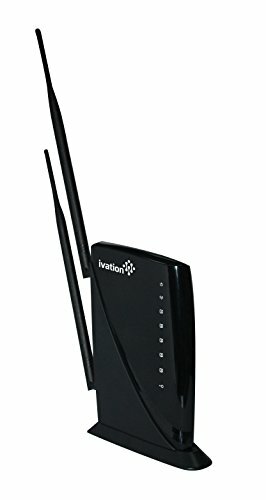 With the High-Power Dual-Band Wi-Fi Range Extender/Repeater from Ivation you can boost your network's range and power across any collection of spaces and enjoy fast, reliable wireless internet without blip or glitch. With 5 RJ-45 gigabit ports-1 WAN, 4 LAN-you can instantly extend your 802.11b/g/n network across extreme distances of up to 10,000 square feet. The powerful signal also penetrates solid walls and reaches over from building to building thanks to a smart repeater equipped with advanced dual 600mW amplifiers and 7dBi detachable high gain antennas. Built-in security features keep your network safe from intruders and offer flexible restriction controls, while MIMO technology ensures your signal goes further, faster, and more reliably without errors. Long Range Wi-Fi Coverage Upgrade your home or office to the far-reaching wireless internet your modern lifestyle craves. Dual 600mW amplifiers and two 7dbi high gain antennas supply the power you need to wire up to 10,000 square feet with wireless connectivity. Powerful Penetrating Signal What wall? Enjoy whole-building Wi-Fi across multi-level or multi-dwelling homes, basements and garages. With an Ivation-grade signal, you can penetrate walls and floors, avoiding dead zones in offices, warehouses and detached structures. Smart Security Built In Connect at your convenience. WEP, WPA, WPA2, WPA Mixed, and WPS compatibility gives you the power to control access through on/off schedules, specific user authorizations, parental controls, and much more. Easy Installation & Setup Get up and running fast. Included quick start guide and user guide CD with Setup Wizard walk you through a simple setup process, which will have your wireless going long range in short order. Adding to your existing networks is a cinch.